The Facility assists partner counries in their efforts to make the transition to an inclusive green economy, and improve their resilience to the consequences of climate change. 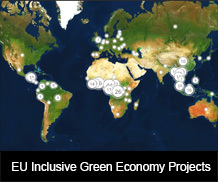 This includes technical assistance (directly targeting EUDs in partner countries) in the formulation of actions related to inclusive green economy and assistance with access to finance. Many SCP measures are suitable to developing countries. While some measures require important upfront investments to adopt new technologies, others only require knowledge or can be relatively cheap and provide immediate economic returns, such as the collection of residues from forestry and agriculture activities to produce biomass and generate energy, water wastage reduction in the agriculture sector, integrating the informal collectors into waste management and recycling systems, etc.